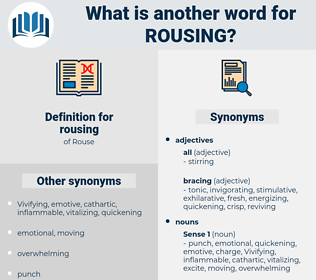 What is another word for rousing? redeploying, galvanizing, motivating, Mobilizing, Marshalling. Be sure of this, that for every house up here that is destroyed, three or four in the south are slowly rousing to arms. Then he shook her gently, as he had a thousand times when rousing her from sleep. Russian Mayonnaise, rushing, rock music, razing, raising, rakishness, racing, raging, reaching, rashness, reeking, rejoicing, recognise, reechoing, reorganize, rhesus monkey, razzing, reorganise, recency, raisin cookie, racing gig, Recommence, reigning, Rosa Chinensis, riskiness, Rockiness, recusancy, regency, reckoning, rising, rosiness, regaining, rock snake, rigging, resinous, racemose, recognize, raciness, richness, roguishness, resonance, reasoning, roughness, racking, roughneck, ricinus, rose moss.